In the 1980's, Janet Woititz broke new ground in our understanding of what it is to be an Adult Child of an Alcoholic. In this updated edition of her bestseller she re-examines the movement and its inclusion of Adult Children from various dysfunctional family backgrounds who share the same characteristics. After decades of working with ACoAs she shares the recovery hints that she has found to work. Read Adult Children of Alcoholics to see where the journey began and for ideas on where to go from here. Janet Woititz (1938-1994) is the author of Adult Children of Alcoholics, which was on the New York Times bestseller list for over a year. She wrote several other books, including Lifeskills for Adult Children; The Self-Sabotage Syndrome; The Struggle for Intimacy; Marriage on the Rocks; Healing Your Sexual Self and many others. Woititz was the director and founder of the Institute for Counseling and Training in West Caldwell, New Jersey. 5.0 颗星，最多 5 颗星Understanding your own behavior and patterns in relationships. Not all of the information is incredibly profound, but this is the only mental health book that has ever changed my life. My parents are both alcoholics, I lived with only one growing up (the abuser). I had a decade-long relationship out of high school that really baffled me. I was disgusted by this person and they didn't treat me well, me being with them pushed others away, and I couldn't understand my undying loyalty to them or why I stayed out of pity instead of love. I also have issues with impulse control to some extent and I fail to take care of myself. I also had a hard time understanding why my role in the family was different from that of my siblings. I knew the answers somewhat, but having them put into clinical terms makes it so easy to identify and move forward in life. My life has done a complete 180 since I had these realizations last year. It's empowering knowing where your behaviors comes from, how to identity behaviors that don't serve you well, and how to act in a manner that doesn't allow your childhood to dictate the rest of your life. I randomly found the first edition at a yard sale and it's a good first step towards healing. Basic info, but sometimes you have to start at the basics. LIKE: The book is built on observation, very few conjectures or unrealistic statements. RECOMMEND: I don't like alcohol, my dad is AA, but I have never understood the drinking obsssion. So I grew thinking I was out of the scope of AA specially because dad stopped drinking when I was 9. But now I realized at 32 years old that I am very compulsive and cannot have a balanced approach towards work, food, shopping: it has to be always at the extreme, else is not worth the experience. So I arrived to this book and I see I comply to seven of the 13 characteristics of adult children of alcoholics. THEN I recommend this book anyone who has lived with an alcoholic person. WHY 5 STARS: Based upon its utility for a person in similar circumstances. 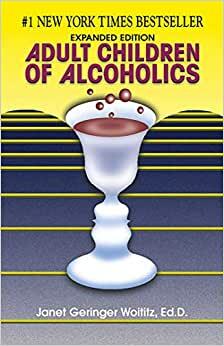 You didn't have to have parents whom were alcoholics to read and learn from this book. Any child raised in a dysfunctional family can relate. Don't let the title throw you off. Opened up some things for me that I wasn't aware of and I am an adult child of an alcoholic; albeit I was raised in a broken home. I was surprised how even though Dad wasn't really in our home living with us that he really WAS THERE and so was his alcoholism. It affected all of us. I'm 57 and I'm just now learning how his addiction shaped our everyday lives even into adulthood. How I cope with stress, how I don't trust people straight away, how I second guess myself constantly and how confusion, fear, manipulation, and various forms of abuse keep entering my life and the lives of my other immediate family members, and how I've chosen specific types of people who practice manipulation on me because I'm an easily identifiable peson who can be controlled and moved about as if I'm a pawn on a chess board just by them watching and listening to me- I am a people pleaser and will let anyone walk all over me. I rarely have the courage to stand up for myself because I frankly I don't know how. I don't know how because I wasn't allowed to and have been given demeaning messages about myself, my charachter, my ideas... all of my life. I have no self esteem so they know I can be controlled by the way I act. So this book and a few others have helped me to say "No more" to these people. I'm able to recognize who my manipulators are better and to back away quietly and then I begin to easily control the relationship on my terms now. I've got a long way to go but this book really did help me. As a nurse practitioner I’ve recommended this book to thousands of my patients. Ever felt like you “hit a wall” and didn’t understand why between ages 40-80? Did you grow up in an addicted, alcoholic, or workaholic home? Dealing with depression and don’t know why? Read this book! Read the “laundry list”. Honestly, this book helped save my life! Highly highly recommend.